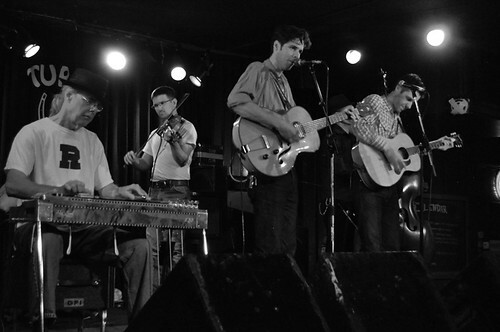 cactus blossoms, originally uploaded by jenniferlarson. Little date night to see the Cactus Blossoms at the Turf Club. love!, originally uploaded by jenniferlarson. Spent some time at the capitol today before the Senate vote on the marriage equality bill. Whoo hoo, MN! Fun to see neighbors and friends and feel the love in the air. lil chick, originally uploaded by jenniferlarson. 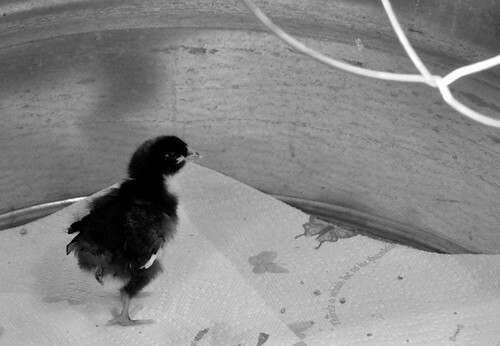 I stopped by Egg Plant today (urban farm and garden store) on an errand, and they’ve got some cute baby chicks! 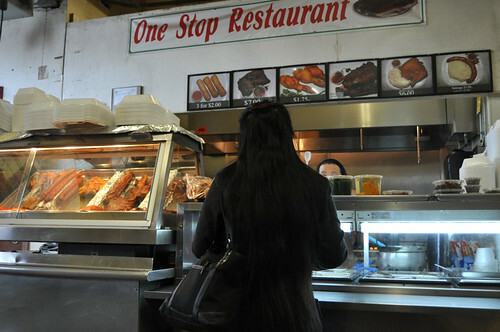 one stop restaurant, originally uploaded by jenniferlarson. We took our nephew on an adventure with our family today for a belated birthday. First we went to the Hmong Marketplace in St. Paul, which was great. We gave the kids money and the task of picking out food for all of us. I can’t resist putting up a second photo for the day. 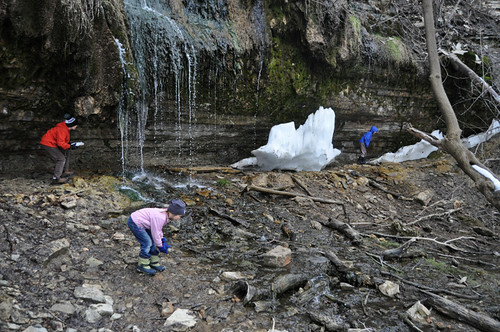 Next we went to the waterfall near St. Thomas and down to the river for some great outdoor adventures. 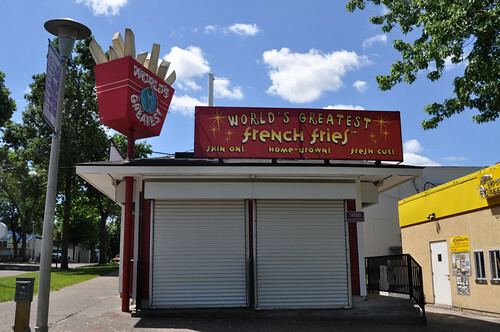 french fries, originally uploaded by jenniferlarson. I drove through the State Fairgrounds after a meeting today. golden horse, originally uploaded by jenniferlarson. Miss G. and I went on a field trip today to the state capitol, just the two of us. We got there via bikes and bus. I watch the kids on Thursdays, and I realized that this was my last Thursday morning with just Grace (while Isaiah’s at school) before Kindergarten starts. 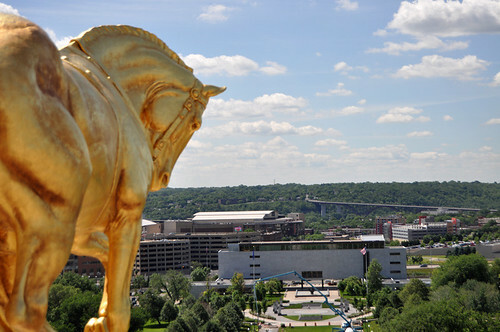 Just an FYI, there are free tours on the hour at the capitol, and the only way you can go up see the golden horses on the roof is to go on a tour. university ave. projection, originally uploaded by jenniferlarson. Wing Young Huie’s University Avenue Project opened today, with photos in windows up and down University Ave. in St. Paul. 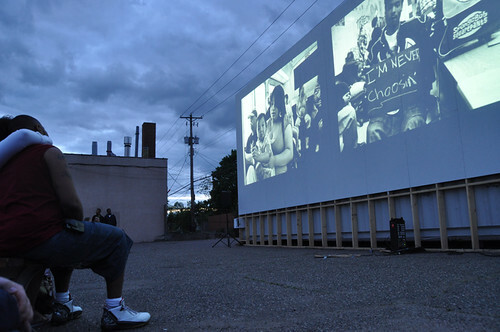 Every night, starting tonight, photos will be projected onto shipping containers in a lot at 1433 University Ave. with music. It was pretty magical to be there tonight.